Now, we all enjoy a naughty takeaway from time to time, and there is nothing hugely wrong with that. There are few things which give me more joy on a lazy Friday night than pulling up to my house with a warm bag on my lap, stuffed with special fried rice, spring rolls and prawn crackers. However, there is a limit for everyone and – for me – that limit comes way, way before the 7,000 calorie mark. 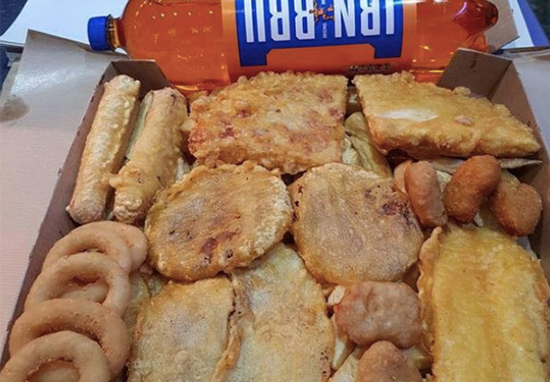 Dubbed ‘Britain’s unhealthiest takeaway’, Glasgow chippy East West Spice is serving up a monster box piled high with fried food, layered over a bed of thick cut chips. This is washed down with the unofficial national drink of Scotland, Irn-Bru. For £10, you can consume 6,792 calories worth of chips, fish, sausages, pizza crunches, hamburgers, onion rings, chicken nuggets, fritters and fizzy pop. Now according to the NHS, a man’s daily calorie intake for maintaining his weight is around 2,500kcal. For a woman, this is 2,000kcal. Now, even if this was your only meal of the day, you would be eating enough for three fully grown men and then some. It’s therefore unsurprising this box has caused some alarm, with people reacting with both horror and hunger after Scottish writer Ross McCafferty tweeted a picture of the humungous feast, noting it could ‘feed a family of six for a week’. A chippy in my hometown is selling this ‘crunch box’ for a TENNER and if you don’t think it looks like the most appetizing thing ever then there’s no hope for you. I could soooooooo eat this right now, I’d have to add a shitload of mustard and brown sauce though. One person even photoshopped the curiously beige banquet onto the Scottish flag in a show of national pride. However, others were not quite so enthusiastic; understandably conscious of the toll such a hefty dinner would have on a person’s heart. Someone even suggested the box should have been ‘coffin shaped’. I’ve worked in then run catering businesses for over two decades. The quality of the product must be stupendously bad to make the crunch box economically viable. I’m talking beaks and a*seholes here. If that box was in the X-Men universe it would be known as ‘Diabeto’. I’ve worked in then run catering businesses for over two decades. The quality of the product must be stupendously bad to make the crunch box economically viable. I’m talking beaks and arseholes here. Cheers to everyone getting in touch to tell me that a box full of deep fried and battered food is unhealthy. I know some big eaters, but I don’t think I know anyone who could polish this lot off all on their lonesome. Please don’t try to, your arteries will thank you later.